OMEGA's data recorder software is an easy-to-use, Windows-based software package allowing the user to collect, display and analyze data effortlessly. A variety of powerful tools allow the user to examine, export and print professional looking reports with just the click of a mouse. Our cutting-edge software is designed for the continuous monitoring and alarming of all OMEGA's OM-CP Series data loggers and OM-CP-RF Series wireless transmitters. The software can collect and display real-time data from any OM-CP Series logger directly connected to the user's PC, a local area network, or even remotely through the use of OMEGA's OM-CP-RF Series radio frequency transceivers. OMEGA's software offers a real-time alarm notification function which lets the user monitor user-defined alarm limits. 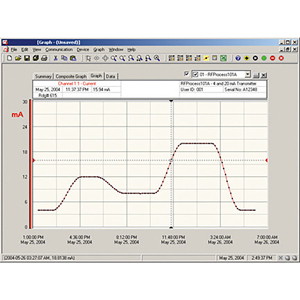 OMEGA's software is ideal for applications when notification of out-of-range conditions is required. Alarm messages can be sent in real-time right to your desktop or sent remotely via email or pager. It offers a straight-forward, user- friendly tool to provide a complete monitoring and reporting system for all of your needs. Let OMEGA's software make quality control easy for you. The logical evolution from the existing strip chart recorders, OMEGA's software allows you to efficiently monitor critical systems continuously without having to leave your desk. Omega's software offers a real-time alarm notification function which lets the user monitor user-defined alarm limits. Alarm messages can be sent in real time to your desktop or sent remotely via email or pager. The alarm notification feature is available for the Real Time Chart Recording mode only (the logger must be connected to the PC, and the PC controls the collection of data). Before starting the recording, the user can select the Recording Setup command from the toolbar to set up the alarm limits and type of notification. The real-time alarming feature is available for virually all of the OM-CP series data loggers. The alarm messages can be displayed in a window in the software, the software can send an email to a user-specified address, or it can dial a phone number using the PC modem and leave a numeric message code (e.g.911). The OM-CP software real-time alarming functionality is not intended to be used as the sole reporting mechanism in mission-critical applications, or in situations where personal safety may be at risk. Simultaneously analyze data from several units or deployments; easily switch to a single data series. Automatically aligns and synchronizes data from multiple loggers on a single graph. The Excel button on toolbar allows simple one click data export to Microsoft Excel. One click of the Excel Icon will automatically open Excel and format the data into a spread sheet. This command will automatically synchronize, in time, data from multiple data loggers and store the data in an Excel spreadsheet. Data may be exported in the following formats: *.dat -This is our own internal ASCII data format which can be viewed by most text editing or word processing software. *.txt -Files stored in this format contain tab delimited text and can be viewed by most word processing and spreadsheet programs. *.csv -Files stored in this format contain comma separated values and are directly readable by Microsoft Excel and many other spreadsheet programs. Real-Time Recording: Collect and display data in real-time while continuing to log. Statistics: Automatically calculates averages, minimum, maximum, standard deviation, and mean kinetic temperature. Summary: View statistics and alarm information in a simplified report format. Zoom: Magnify data of interest with powerful zoom and drag tools. Supports multiple zoom in and zoom out. Features extended zoom capabilities; box zoom, vertical zoom,and horizontal zoom as well as point and click. Formatting Options: Change colors, line styles, plotting options, show or hide channels in an instant. Scaling Options: Autoscale function fits data to the screen or allows user to manually enter their own values. Engineering Units: Define the type of units to be displayed on the graph using the Engineering Units Wizard. User defined engineering units may be applied to voltage, current,pulse, event and state loggers. Menu Accessibility: Right click on the graph for easy access to all formatting, measurement units and graphing tools menu options. Annotation: Easily annotate specific data points on the graph with a click of the mouse. Graphical Cursor: One click displays readings by time, value, parameter or sample number. Printing: Automatically print graphical or tabular data. Communications: Automatically sets up communications port or lets user set configuration. Logger Configuration: Easy set up and launch of data loggers with immediate or delayed start, preferred sample rate,and device ID. Calibration: Fully digital calibration function automatically stores parameters in device. A calibration Wizard is provided in the software to simplify the calibration procedure. Uninterrupted Data Retrieval: Data may be downloaded from the logger without interrupting the operation of the unit as it continues to log data. 참고: Operator’s manual and interface cable are included with each software/cable package (required for data logger operation, sold separately).